Cyclesnack: West Side Blue Blaze Trail needs some TM! On the map above, up is North, left is west, right is east. The other day, when Paula, Tren, Henry (the AMC Master Sawyer) and I went to cut blow downs on the Upper Gussy we took the West Side Blue Blue Blazed Trail from the Echo Valley Lot. 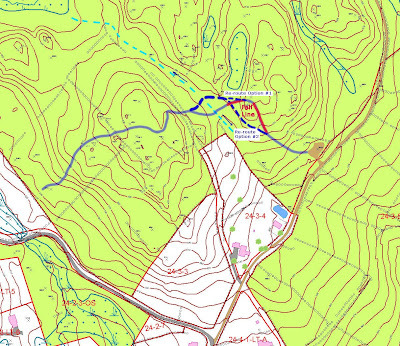 Once you get over the knoll, the trail runs through a particularly wet area, another vernal pool drainage, similar to what the Upper Gussy encounters to the north, only here it way more stream like. Now, why should I care about this trail, since it's technically not for biking? The reason is I think this will be an important connector trail to the Upper Gussy if you are parking at Echo Valley and want to do a loop, especially in the winter time when the Blue Blazed Trail (aka The Newtown Trailway, aka Al's Trail, aka The Lilinohnah Trail) along the river is closed to protect the Bald Eagle habitat at the Shepaug Dam. Pictured below is Tren and Henry trying to negotiate the trail and try to stay dry but as you can see, that is hard to do. Having been through here quite often, I would say that this section is only dry during the driest parts of the summer and thus something should be done about this part, as well this portion of the trail. In the blow up of the crossing, below, I show two possible alternatives. The first alternative redirects the trail around the larger wet area and takes the trail to the narrowest spot, while still wet, is more rocky and more of a seepage rather than free standing water. 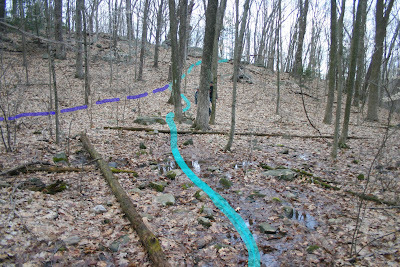 The first alternative takes care of the existing route on a fall line, too, which as we all know is susceptible to erosion. The second alternative is to by-pass this knoll altogether. I would prefer this option because it will also eliminate the fall line on the east side of the trail as well. Erosion here is pretty bad. When we walked up it you could see how the recent rains were starting to create a little gully down the center of the trail. You could do water bars but I think you would only resort to that option if you had no other choice. In this case you do. Here is what the knoll looks like in the background and the wet area in the foreground. 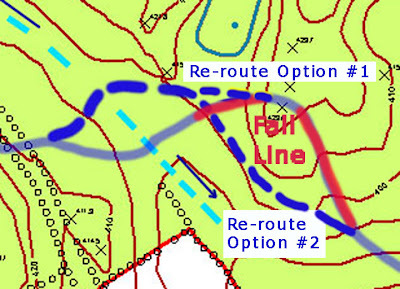 Below is what the first re-routing option might look like. 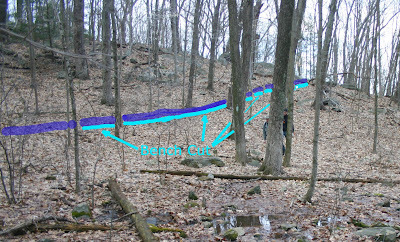 Adding a bench cut to this re-routed portion would define the trail really well and keep people on the intended route. I don't think sloshing through this wet area would be too appealing, anyway. Below is what the second alternative might look like. Might need to do some benching but it wouldn't be much. Again, this second alternative does take out two fall lines as opposed to taking out just one with the first alternative. When might this get done? Guess it depends on who has the time and energy. I don't have the time right now, with Upper Gussy work that will probably take me into June or July, and then I want to help Paula, across the river, with George C Waldo, which will span into late summer. Maybe the folks at CFPA could arrange for a day.